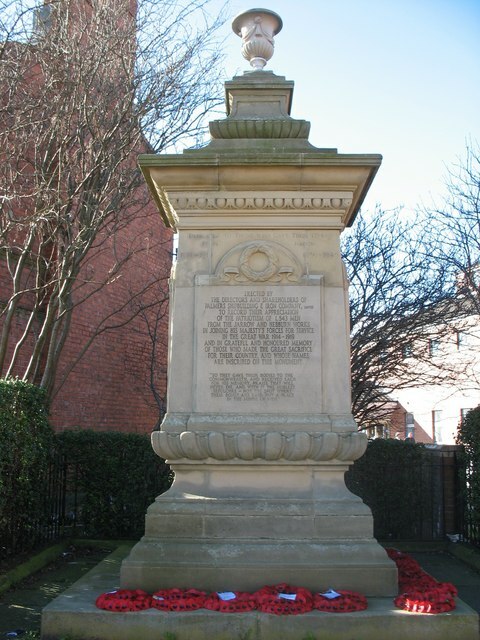 "Palmers Cenotaph in Clayton Street Jarrow (adjacent Palmers Hospital) Roll of Honour 1914-1919 Erected by the Directors and Shareholders of Palmers Shipbuilding & Iron Company Limited. To record their appreciation of the patriotism of 1,543 men from the Jarrow and Hebburn Works in joining his Majesty's Forces for service in the Great War 1914 – 1919. And in grateful and honoured memory of those who made the great sacrifice for their Country. And whose names are inscribed on this monument. “So they gave their bodies to the Commonwealth. and received each for his memory, praise that will never die. And with it the noblest sepulchre - Not the spot where their bones are laid, but a place in the minds of men"" Photo by Vin Mullen, 2009.